Does your cat need to go outside to be happy? It is a common belief that cats need to go outside to be happy. In fact, cats can lead fabulous lives indoors. Indoor cats live two to three times longer than cats who go outside. Indoor cats appreciate an environmentally enriched home that will keeps them stress free and healthy. Read the full Tails of Marin Article about keeping your cat happy. The lists below are provided as a resource only and do not imply endorsement by Marin Humane. Commercial kits and diagrams for enclosures available in various sizes and prices. Professional installation available. Also offers custom enclosures. Commercial kits for indoor and outdoor cat runs and enclosures. Various commercial enclosures for cats and other small animals. Most enclosures are preassembled. 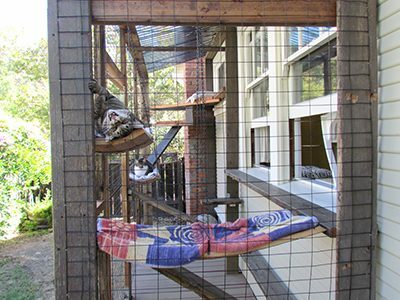 Provides custom and DIY kits for indoor and outdoor cat enclosures. Free-standing gazebo style outdoor cat enclosures for yard or patio. Detailed drawings and descriptions to create custom outdoor enclosures for cats and other small animals. Also includes instructional links for building your own. Lots of ideas for building your own enclosures. 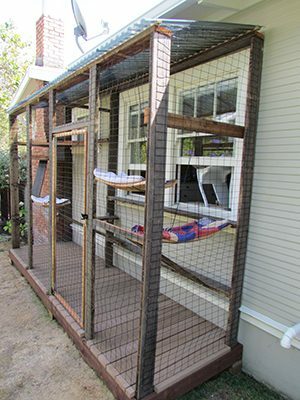 Modular indoor/outdoor cat enclosures. Expandable and portable for RV use. Portable, light-weight, non-permanent cat enclosures. Commercial kits and instructions for free-standing cat fence systems.. And now offering “Cat-Proofer” system for converting existing fencing to make it escape-proof.